Do poor people and the poorest countries receive the most aid? Many countries receive aid, and several for decades. Since 1960, the highest average poverty rates have been observed in the Democratic Republic of Congo, Burundi, and Liberia, where an average of 87.7%, 84.0%, and 83.8% of the people in these nations, respectively, live in poverty. On the other hand, in terms of the total amount of ODA received during the same period, India, Egypt, and Bangladesh ranked first, with average net ODA receipts of 4, 3, and 2 billion dollars, respectively. As a percentage of recipients’ gross national product, GNI, the top ODA recipients were the Marshall Islands, Palau, and the Federated States of Micronesia with 37%, 38%, and 41% of their GNI, respectively. Clearly, these examples illustrate that individual countries’ ODA receipts and poverty rankings can be reported in various ways. One way to avoid such ambiguity is to group countries into income categories and compare poverty and aid levels across country groupings. The remainder of this analysis does just that. Developing countries are grouped into the World Bank’s three income categories: Low Income Countries, Lower Middle Income Countries, and Upper Middle Income Countries. The grouping is based on countries’ GNI per capita in 2014. Data on poverty and aid between 1980 and 2012 are aggregated across these categories in three-year intervals. 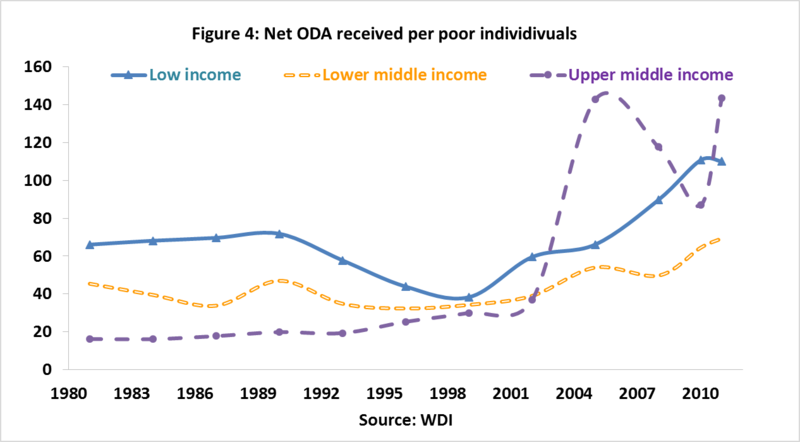 Figure 1 illustrates the levels of ODA received across the three income categories in the periods between 1980 and 2012. It shows that the poorest countries, low income countries, received less aid than lower middle income countries almost every year. In 2005, low income countries actually received, as a group, the least amount of aid. On average, lower middle income countries received 45% more ODA than low income countries. At first glance, Figure 1 suggests that Deaton is right. However, these numbers may be misleading. Rather than comparing the total amount of ODA received, it is important to account for the relative populations and incomes of the three country groups. Figure 2 shows total ODA received by country grouping on a per capita basis. The results are now the reverse of those shown in Figure 1. Low income countries actually received the highest ODA per person, lower middle income countries received the second highest level of ODA per person, and so on. 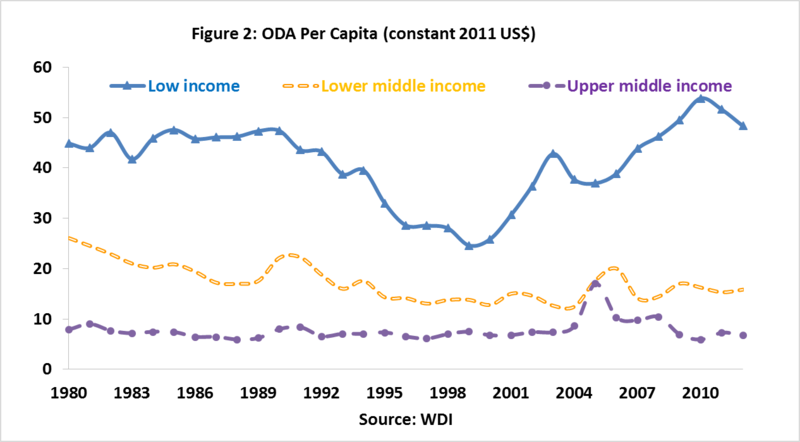 In contrast with Figure 1, on a per capita basis, low income countries received twice as much ODA than lower middle income countries, and four times more than upper middle income countries. Of course, this does not necessarily mean that donors allocate most of their aid to the poorest countries. High ODA per capita can be a consequence of a low population size in the category of low income countries. Nonetheless, Deaton is wrong from this perspective. Accounting for nations’ income level leads to results identical with those above. 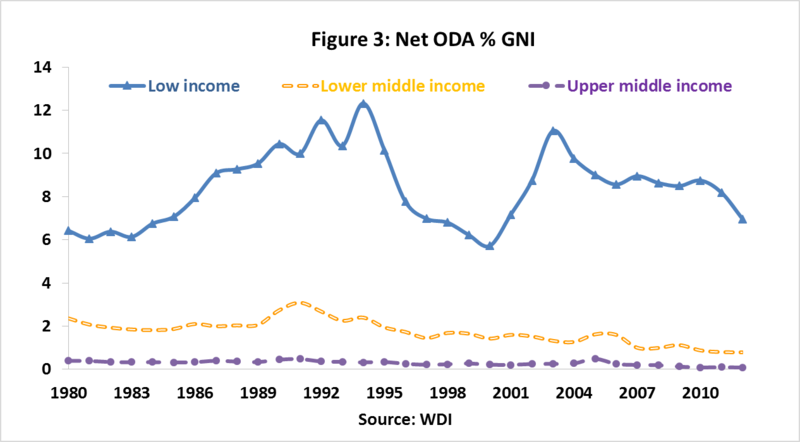 Figure 3 shows that low income countries received the highest share of ODA out of their total GNI between 1980 and 2012, with an average share of 8%. Lower middle income countries received only 2% of their GNI in ODA. Once again, this does not necessarily mean that donors allocate the majority of their aid to the poorest countries. Instead, it may be the case that, holding ODA constant, low income countries have extremely low incomes or few alternative sources of income in the formal economy so that the ratio of ODA to their GNI is bound to be high. While considering income and population levels is important, the most appropriate method to compare across country category is to control for the number of poor people across country income categories. The logic behind this is straightforward. To alleviate poverty, the number of poor people in a country provides a more relevant measure than its overall population. Figure 4 shows the ratio of ODA to the number of poor individuals, or headcount, at a $1.25 PPP poverty line. 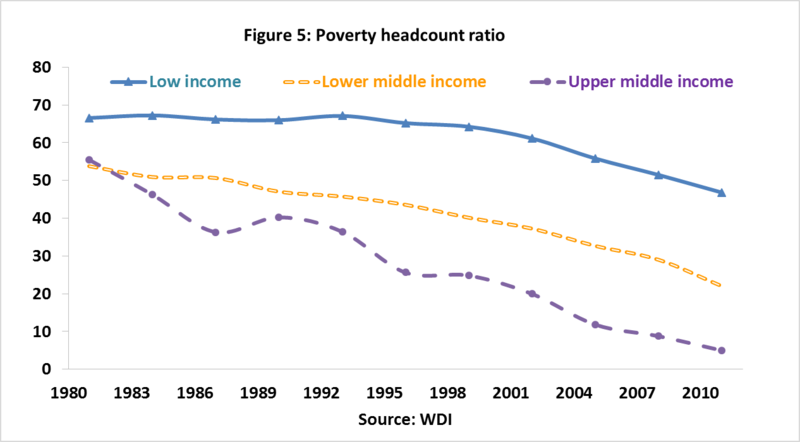 Figure 4 indicates that the poor in low income countries consistently received the highest share of aid prior to 2001. More importantly, ODA per poor person to low income countries has been growing rapidly since 1998, and it has doubled since then. Yet, ODA per poor person to upper middle income countries has grown even faster. Between 2001 and 2004, the share of ODA per poor individual going to upper middle income countries climbed sharply from $40 to $140 and dropped to nearly $80 in 2010 before rising again. Two factors contribute to this jump in ODA per poor person. First, this era coincides with a surge in aid to upper and middle income countries. 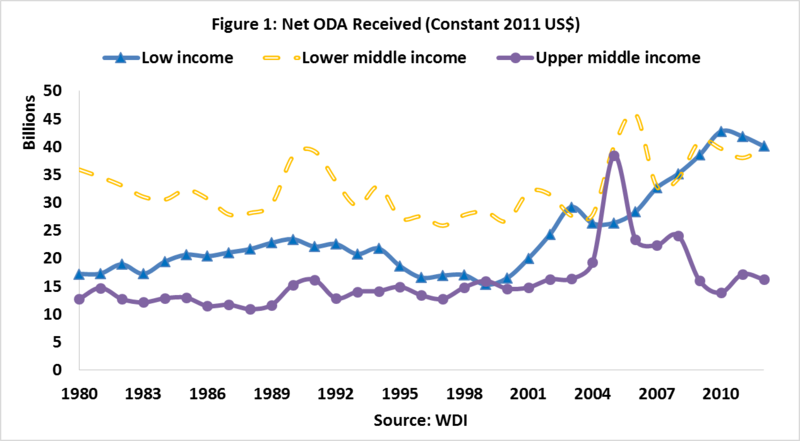 For instance, Figure 1 shows that ODA to upper middle income countries more than doubled between 2002 and 2005. Second, there was a sharp fall in poverty in upper and middle income countries during this time period. Poverty in upper middle income countries fell from 20% to 11% of the population (Figure 5). So what does this mean? These figure indicate that it is safe to conclude that aid is most likely distributed such that the poorest receive the most. The claim that aid is allocated regardless of poverty levels doesn’t seem to hold here. Of course, one can argue that the method of grouping countries based on their GNI per capita in 2014 is misleading since some of the countries have historically moved across each group. For instant, China was a low income country until 2001, lower middle income country until 2009, and upper middle income since then. In this appendix countries are aggregated in three income groups based on their historical GNI per capita, allowing nations to move in and out of their groupings as their GNI per capita level changes. The results are much stronger in refuting the claim that ODA does not go the lower income countries. Deaton, Angus (2013-09-22). The Great Escape: Health, Wealth, and the Origins of Inequality (p. 278). Princeton University Press. Kindle Edition. Download the data used for this post.